Spilling one’s guts in a LiveJournal entry, compiling a year-end list of favorite albums, comparing favorite characters from The Breakfast Club– these may be typical pastimes for certain sects of indie rock listeners, but they are not, as a general rule, the typical subject matter for indie rock songs. But then, Los Campesinos! is no typical band, and their debut full-length, Hold On Now, Youngster… is no typical album; it is, rather, a sort of meta-indie rock album, an indie rock album about indie rock. 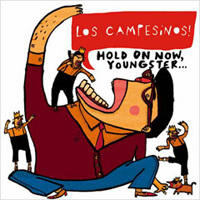 And, as the band’s exclamatory name suggests, they’re about as enthusiastic toward their subject matter as rock bands get; while a lot of Pitchfork-approved indies thrive on a certain sense of detachment and irony, the Campesinos are driven by a genuine love for the music, to the point where their references to LiveJournal and heart-breaking punk rock songs are not tongue-in-cheek or droll, but, rather, they’re genuinely affectionate, and yes, even affecting. And it’s that sweet spirit and sense of humor that makes them stand out from the crowd; their raucous guitar rock, their cheery use of bells and chimes, their Arcade Fire-styled catharsis, their bellowed, half-sung vocals, and even their good-natured wit are all in service of songs that vigorously celebrate the jubilance of indie rock music– and the sense of community that it inspires when it’s at its very best. Not only does that keep them from sounding like a messier, rowdier version of Art Brut, but it also means that, as the line between artist and fan is blurred, it’s not to serve some kind of postmodern formal experiment or hipster joke– it’s to open the gates and let the world know that indie rock doesn’t have to be for the elite, but, rather, it’s for anyone who shares the Campesino’s enthusiasm for a good old-fashioned squealing-guitar racket.